Set your Jeep apart from the crowd with the Ironman 9300 Street Series Wheel in Matte Gunmetal with Matte Black Beadlock Ring. These heavy-duty aluminum alloy wheels come in 17x8.5 4.51in Backspace (- 6mm Offset), and feature a simulated beadlock design. Dirty Life uses their patented High Strength Lip (HSL) technology to create a rugged wheel that can withstand substantial abuse on and off road. 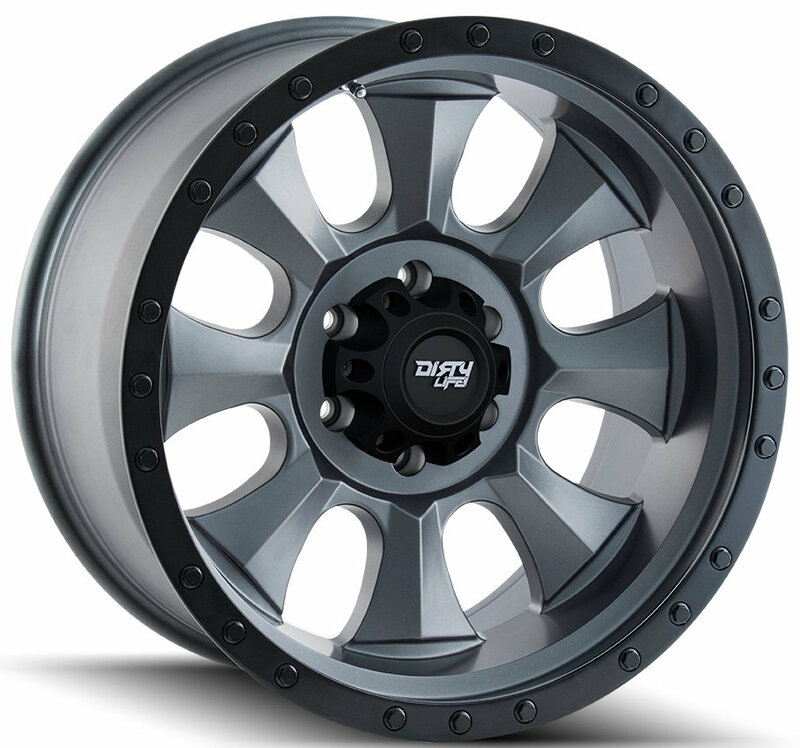 The Ironman 9300 wheels are coated in a corrosion resistant Matte Gunmetal Gray finish. For added contrast, the simulated beadlock ring is finished in Matte Black. Dirty Life backs their wheels with a One Year Finish and Limited Lifetime Structural Warranty. Gunmetal Gray: Dirty Life uses a tough corrosion resistant Matte Gunmetal Gray finish on the wheel, and Matte Black on the beadlock ring. This design two-tone design offers a great accent for your Jeep. Aggressive Styling: Dirty Life uses a sculpted eight spoke design for their Ironman 9300 Street Series Wheels. In addition to wide beveled spokes, these one-piece wheels also feature a simulated beadlock ring. Heavy Duty Construction: The Ironman 9300 Street Series Wheels are reinforced by Dirty Life’s patented High Strength Lip (HSL) technology. By using a strengthened lip, Dirty Life ensures their wheels will not crack, bend, or deform even on the toughest terrain.